A small beetle with a long snout that causes damage to crops or to stored grain. 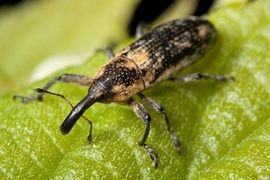 If eaten by humans, weevils can cause disease and infection, and are known to transmit E. Coli. It costs $125 to $250 to hire an exterminator to get rid of weevils.